DA11, Digital to Analog Converter from Lavry Engineering. Lavry Engineering has released a new stereo DA Converter that allow to control the stereo image, the DA11. According to Lavry, "applications include adjusting the stereo width to create a headphone listening experience more like listening in a room with speakers, or moving the “sweet spot” with asymmetrical speaker placement." 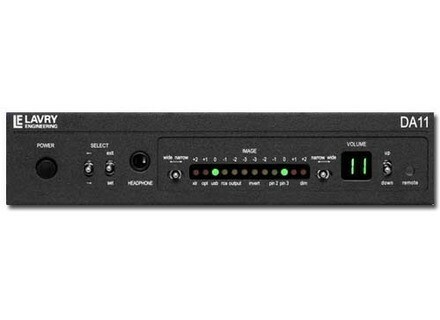 USB, XLR, RCA, and optical digital audio inputs are designed to offer flexibility in using computer, network music, or stand alone CD player sources, as well as studio equipment. Balanced and unbalanced output options are provided for ease in connection to a wide range of HiFi as well as professional audio gear. The remote Mute function controls both headphone and main outputs, while a separate main output On/Off setting is designed to add flexibility for private headphone listening. The DA11 features the ability to control speaker volume using digitally controlled Analog volume circuitry. Low jitter mode to minimize source degradation. Patent Pending >PiC< Playback Image Control™. Potentiometer-free digitally controlled analog volume circuitry. XLR, USB, RCA (Coaxial) and Optical (Toslink) digital inputs. For more info, visit www.lavryengineering.com. Fostex PM0.4 - White Finish The PM0.4W Powered Studio Monitor is Fostex's latest speaker. Shure Releases 2 New SM Mics Shure has announced the introduction of the SM27 and SM137 microphones.